Can we work together, miss? : a guide to collaboration and collusion. When is working together acceptable? When does it cross the line into dishonesty and cheating? Some definitions and examples to guide students, parents, and teachers too. Copyright, plagiarism and fair use: 10 basic principles : some simple guidelines for what's allowed - and when! Credit where it's due: the school library preventing plagiarism. 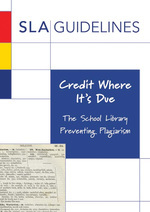 Published 2011 by and available from the School Library Association. Detecting plagiarism : a self-help guide : when to suspect, how to detect, how to stop it happening in the first place! "From literacy to information literacy: reading for understanding in the real world," in From Aesop to e-book, selected papers, edited by Penny Moore and others. International Association of School Librarianship, 2004. Good Searching : some tips and hints for more effective searching, compiled for participants in the presentation "Between the Lines : the Holes in the 'Net" at the ECIS Annual Conference, Berlin, November 2002.This is a downloadable Word (.doc) file. How to Cite Right and Avoid Plagiarism, Without Tears : know what plagiarism is, and how to avoid it. This is a downloadable Word (.doc) file. Is it a scam? On 13 January 2003, I received an email telling me I had won 1,000,000 Euro - as long as I claimed the prize by 31 January 2003. I thought it was a scam, and I did not respond. Did I give up the chance of a fortune? Look at the evidence and decide for yourself! If YOU received this email, would you write back to claim your prize? Make your point! (The message is the point, not the Powerpoint!) What makes good presentations so good? What makes awful presentations so awful? Some tips to help you make your presentations more presentable. "More than surviving: thriving in the information age: reading as a basis for using information technology efficiently," in Education for all: culture, reading and information, selected papers, edited by Snunith Shoham and Moshe Yitzhaki. International Association of School Librarianship, 1998. MUN Research Guide A guide to some of the resources available in Robert College Library, and some useful web sites as well. "Quis custodiet: investigating the investigators", in The School Librarian, 49 (4), Winter 2001. Reading Matters a series of six articles, first published in the monthly newsletter of the International School Hamburg, 1995. "'To read or not to read?' was never the question," in A Bridge in the Middle, the journal of the European League of Middle Level Education, 4 (1), December 1994. Where the truth lies first published in School Librarian, 47 (3), Autumn 1999. It was last revised on 9 September 2011.